>Have I become a Jason Castro fan? > Ramiele Malubay and Michael Johns were my two favorite contestants this season. Both are gone now and I barely watch the show. 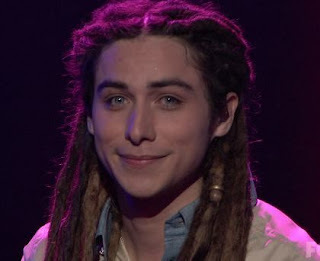 Though I have to admit, even before their departure I was starting to slowly but surely finding interest in none else than Jason Castro… Maybe it’s his goofiness, his messy hair, his big smile or the fact that he looks like a girl or just the guitar or his tight pants?? ?… The guy is an original and he is so distinct from most of what you hear usually, he does not have this mainstream I hear it all the time voice unlike some other contestants. I also like his laid back attitude. I still don’t get the tight pants… But really I could listen to some of the songs he sang again and again. My mom likes David Cook. Even though she doesn’t listen to rock but for some reason she thinks he’s really good, which means that David Cook will probably go really far in this competition, by the way my mom accurately predicted that Michael Johns was going to be eliminated last week while many people were surprised when it happened. I’ll probably ask her from now on who she thinks is going to be eliminated next. This entry was posted in American Idol season 7, Jason Castro by admin. Bookmark the permalink.